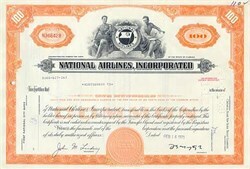 Beautifully engraved and highly desirable Stock Certificate from National Airlines. 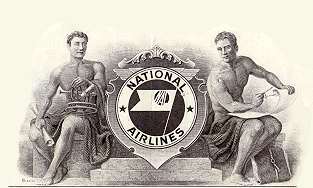 This desirable document has an ornate border around it with a vignette of two allegorical men sitting on both sides of the National Airlines Logo. The certificate was issued in the 1970's for 100 shares of common stock. This airline was well known for its quality of employees and service to its passengers. The certificate has the printed signature of the company's President, L. B. Maytag and Secretary John M. Lindsey. On July 8, 1937, the company was charted under the laws of the State of Florida as National Airlines, Inc. Routes were extended to Jacksonville and to Miami in that year and from Jacksonville to New Orleans in 1938. The company relocated its general offices and principal base of operations in Jacksonville in 1939. National was certified into Havana, Cuba, in 1946 and was awarded a new route from Miami and Tampa to New Orleans in the same year. in mid-June 1946, National moved its General Office to Miami and four years later moved its engine overhaul base to Miami from Jacksonville. Havana service was suspended indefinitely in 1961, after the United States and Cuba broke off diplomatic relations. On January 1, 1952, National became free of subsidy and was placed on a mail service rate that made it self-sufficient over its entire system. National in 1964 became the first exclusively jet-powered U. S. airline. In 1967 and 1968 the airline doubled its jet fleet and phased out all prop-jet aircraft. On April 21, 1968, the last of the prop-jet electras was retired and National became all pure-jet with a fleet of DC-8s and B-727s.